I have been searching for a 2-in-1 styling tool so I can travel around with it and save luggage space. I did not meet any meets my requirement until I was introduced to the new Philips Easy Natural Curler. I have mention about the face cleansing brush - Visapure that I have been using ever since I've gotten it. I have unknowingly became a fan of Philips because coincidentally every household appliances in my house is from this brand. Philips Easy Natural Curler makes it easy to create beautiful curls, it is dummy-proof! It's unique Tulip shape and clever plates hold the hair strand while styling, enabling you to create curls with just one simple movement. 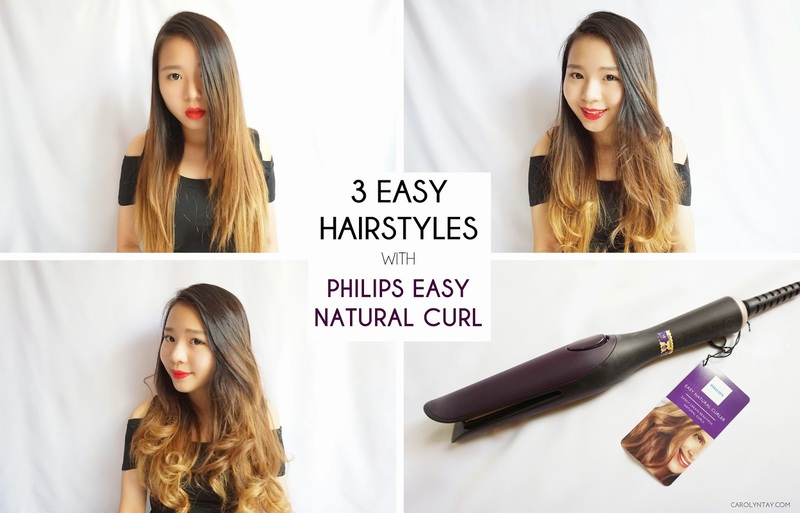 What is special about the Philips Easy Natural Curler? An automatic clip for curling with just one hand. Built with a protecting design which hides the hot styling plates. Slim handle and the size is light and convienient to carry around. Plates are coated with protective ceramic coating to ensures an even heat distribution and less hair damage for shinny and soft hair. The heat styling temperate is maintain at 200°C guarantees nice results even on thick hair, while minimizing hair damage. The plates are also heated in 30 seconds! Just press on the buttons on the side to open the plates to clip your hair. Slowly stroke the plate between your hair. Repeat for your whole head to get a naturally straighten hair! Straight hair is too boring? Add some wave and give it a bouncy healthy look! You just have to slightly curl the bottom part of your hair to achieve the wavy look. Feeling fancy today? Play with some curls! Just clip, roll and stroke down between your hair and it's done! TIP: Just smaller sections to get the dolly look. Although I really love the Philips Easy Natural Curler, I do find it very time consuming to curl my head. I have very thick hair and to get the optimum result, I have to use small sections each time.